Cynics have said, with some truth, that a species is what a competent taxonomist regards as a species. On the other hand, back in the 1930s two American biologists, Mayr and Dobzhansky, proposed an empirical test that could be used to decide whether two populations were part of the same species or of two different species. They recognized organisms as being members of a single species if they could, at least potentially, breed together in nature to produce fertile offspring. They called a species tested and defined in this way a biological species or biospecies. In the examples that we have used earlier in this chapter we know that melanic and normal peppered moths can mate and that the offspring are fully fertile; this is also true of plants from the different types of Agrostis. They are all variations within species - not separate species. Figure 1.7 The orthodox picture of ecological speciation. A uniform species with a large range (1) differentiates (2) into subpopulations (for example, separated by geographic barriers or dispersed onto different islands), which become genetically isolated from each other (3). After evolution in isolation they may meet again, when they are either already unable to hybridize (4a) and have become true biospecies, or they produce hybrids of lower fitness (4b), in which case evolution may favor features that prevent interbreeding between the 'emerging species' until they are true biospecies. Time within species. If the members of two populations are able to hybridize, and their genes are combined and reassorted in their progeny, then natural selection can never make them truly distinct. Although natural selection may tend to force a population to evolve into two or more distinct forms, sexual reproduction and hybridization mix them up again. 'Ecological' speciation is speciation driven by divergent natural selection in distinct subpopulations (Schluter, 2001). The most orthodox scenario for this comprises a number of stages (Figure 1.7). First, two subpopulations become geographically isolated and natural selection drives genetic adaptation to their local environments. Next, as a byproduct of this genetic differentiation, a degree of reproductive isolation builds up between the two. This may be 'pre-zygotic', tending to prevent mating in the first place (e.g. differences in courtship ritual), or 'post-zygotic': reduced viability, perhaps inviability, of the offspring themselves. Then, in a phase of 'secondary contact', the two subpopulations re-meet. The hybrids between individuals from the different subpopulations are now of low fitness, because they are literally neither one thing nor the other. 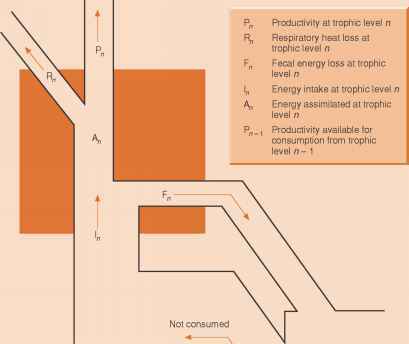 Natural selection will then favor any feature in either subpopulation that reinforces reproductive isolation, especially pre-zygotic characteristics, preventing the production of low-fitness hybrid offspring. These breeding barriers then cement the distinction between what have now become separate species. It would be wrong, however, to imagine that all examples of speciation conform fully to this orthodox picture (Schluter, 2001). First, there may never be secondary contact. This would be pure 'allopatric' speciation (that is, with all divergence occurring in subpopulations in different places). Second, there is clearly room for considerable variation in the relative importances of pre-zygotic and post-zygotic mechanisms in both the allopatric and the secondary-contact phases. Most fundamentally, perhaps, there has been increasing support for the view that an allopatric phase is not necessary: that is, 'sympatric' speciation is possible, with subpopulations diverging despite not being geographically separated from one another. Probably the most studied circumstance in which this seems likely to occur (see Dres & Mallet, 2002) is where insects feed on more than one species of host plant, and where each requires specialization by the insects to overcome the plant's defenses. (Consumer resource defense and specialization are examined more fully in Chapters 3 and 9.) Particularly persuasive in this is the existence of a continuum identified by Dres and Mallet: from populations of insects feeding on more than one host plant, through populations differentiated into 'host races' (defined by Dres and Mallet as sympatric subpopulations exchanging genes at a rate of more than around 1% per generation), to coexisting, closely related species. This reminds us, too, that the origin of a species, whether allopatric or sympatric, is a process, not an event. For the formation of a new species, like the boiling of an egg, there is some freedom to argue about when it is completed. in northern Europe. 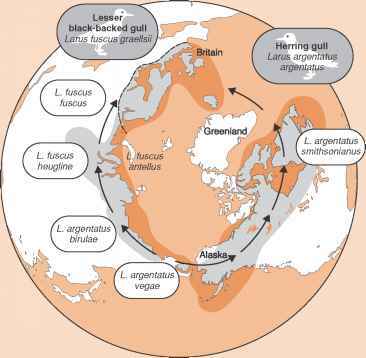 There, the eastward and westward clines have diverged so far that it is easy to tell them apart, and they are recognized as two different species, the lesser black-backed gull (L. fuscus) and the herring gull (L. argentatus). Moreover, the two species do not hybridize: they have become true biospecies. In this remarkable example, then, we can see how two distinct species have evolved from one primal stock, and that the stages of their divergence remain frozen in the cline that connects them. Why different subpopulation are hybridized form low fitness?